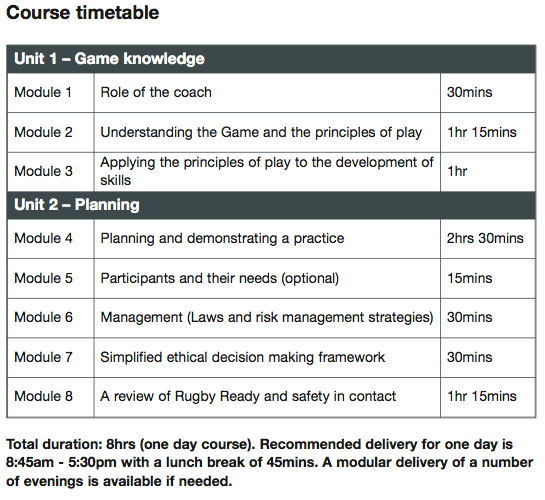 This course is designed to enable coaches to acquire basic skills so that players new to the game learn to play safely, with enjoyable competition. It is an 8 hour Trained Only course with no post-course evaluation. The presence of sport in a person’s life carries enormous benefits for social, physical and personal development while broadening cultural awareness. Rugby is a uniquely inclusive sport, and you as the coach hold a position of genuine influence over a player’s rate of personal development and their sense of community and self-worth. Click here to return training.rugbycanada.ca registration page.